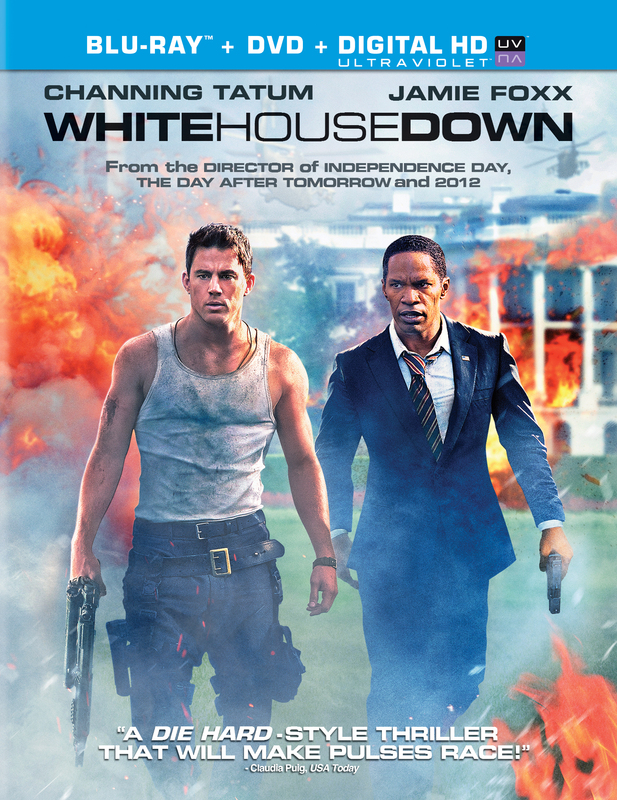 Blu-ray Review: "White House Down"
If only White House Down could have sustained what it was doing in the first hour, it would have been a good movie. During the first hour of White House Down, I couldn’t understand why the movie tanked at the box office. Sure, it borrows heavily from Die Hard, but I love Die Hard, even when it was on a boat (Under Siege) and an airplane (Executive Decision). Toss in a bit of Air Force One, and this film had potential. What’s more, the story and acting in those first 60 minutes were compelling and well executed. I couldn’t help thinking, “Someone didn’t tell Channing Tatum, Jamie Foxx and the rest of the excellent cast that this was a Roland Emmerich blow-em-up, cheesy one liner extravaganza. The movie was actually really good. And then… my Blu-ray counter ticked from 59:59 to 1:00:00 and the whole movie went to hell. It’s as if Emmerich realized that his actors were putting too much though into their work and that this wasn’t supposed to be a action film with brains, but just another stupid action movie. That’s when I realized why White House Down failed to connect with an audience. Tatum plays John Cale, a capital police officer working for the Speaker of the House (Richard Jenkins). Desperate to impress his teenage daughter, Emily (Joey King), John attempts to get on the detail of the sitting Commander in Chief, President James Sawyer (Jamie Foxx, as if you didn’t know). On the day of his interview, Emily accompanies John to the White House. Unfortunately, Secret Service Agent Finnerty (Maggie Gyllenhaal) doesn’t deem John qualified to protect the President and he doesn’t get the job. Disappointed, John nevertheless takes advantage of being at the White House and takes Emily, a history and political junkie, on a public tour. Meanwhile, the Head of the Presidential Detail, Martin Walker (James Woods), has set in motion a terrorist plot to overtake the White House and use the President for a nefarious plot that may or may not have something to do with seeking revenge for the death of his son. Walker has hired a group of black ops mercenaries to secure the perimeter of the White House and shut off the Oval Office from the outside world. Jason Clarke (Zero Dark Thirty), plays the leader of these mercenaries, essentially taking on the role that Alexander Gudonov played in Die Hard, that of the pissed off henchman who wants to kill the renegade hero after one of his best men is killed. As you may have surmised, John gets separated from his daughter and is responsible single handedly taking down most of the mercenaries with the combat skills he learned during one of his three tours in the Middle East. He saves the President and together they become a regular Riggs and Murtaugh. For a President who’s never packed heat in his life, Sawyer is a natural with a handgun. John gets the President to safety so he can go back and rescue his daughter. At the same time, the Vice President (Michael Murphy) is sworn in and the Vice Chairman of the Joint Chiefs of Staff (Lance Reddick) awaits word on whether to launch an airstrike on the White House. This movie could have been salvaged if it didn’t go on and on for 131 minutes and if the gang of writers didn’t rely on idiotic one-liners. If they’d found a way to cut this film down by 15 minutes, it may have been tolerable. Then again, the third act is populated with semi-believable special effects, atrocious dialogue, and enough “ah-ha” reveals to qualify as a Agatha Christie parlor room mystery. Tatum and Foxx, who started the film so strong, end up being puppets in another one Emmerich’s films. Yes, by the end of White House Down, there’s no doubt that you’ve just sat through another Roland Emmerich blow-em-up, cheesy one liner extravaganza. If you love this kind of dumbed down action film, you might get a kick out of White House Down. The Capital building blows up, and half of the White House goes up in flames. A lot of bad guys die and Channing Tatum gets to run around in a tank top. I really wish this film had been able to hold the promise of that first hour, but I should have known better.